This page constitutes the height of photographic art on Borges' texts. Photographs by Sean Kernan. Texts by Jorge Luis Borges. The printed edition is also available. By permission of the author, you can also download this program and use it as a Borges screen-saver. Some of the best documents (manuscripts, first editions, covers, pictures) by and about Borges. They belong to Jorge, Marion and Nicolás Helft, a well-known family of art collectors in Buenos Aires. A graphic presentation (with texts in Spanish) of the CD-Rom produced by Helft & Ferro and published by La Nación. The most beautiful and exciting multimedia work of Borges art ever done. The complete series of illustrations for The Book of Imaginary Beings was done by the graduate students in the Department of Illustration and Art of the Book at the Vakalo School of Art and Design in Athens, Greece. The project was carried out under the Art Direction of Hector Haralambous and Dimitris Kritsotakis and started with a few selected students. As it went on many more students insisted that they had fallen in love with the theme of the book and that they would like to do it as well. 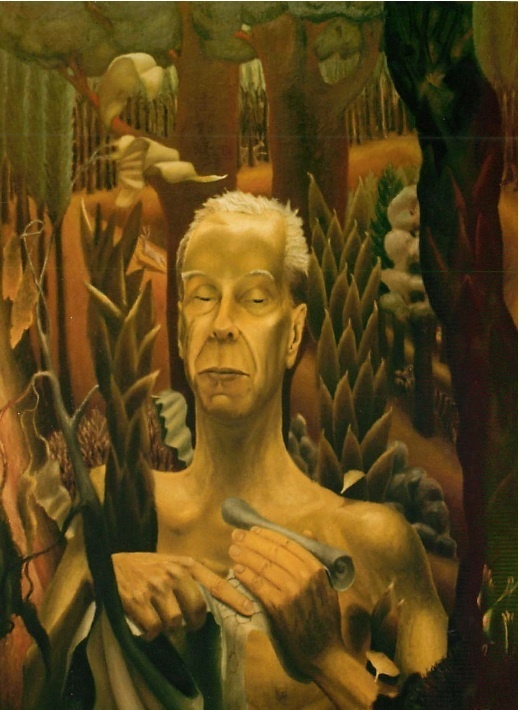 Keith Lima's "Borges the Hierophant." Oil on canvas (1992). A bumper sticker distributed to bookstores by Viking Penguin at the time of the publication of the three-volume edition of Borges in English. Diego Vega's "Hlör u fang axaxaxas mlö. " Sonata for flute and piano inspired by Jorge Luis Borges’ poem “Tankas”, written by the composer Brian Richard Earl. The artists are Maurizio Simeoli, flute, and Paolo Spadaro, piano, both musicians of the “La Scala” Opera House, Milan, Italy. Earl’s work can be overviewed on www.brianearl.net. The Crumbling is a twenty-one-minute stop-motion animation video opera set in a dream-like mythic town following the trials of an apprentice librarian as she tries to save her city from crumbling down around her. The video is projected alongside Gideon's live musical performance. The piece explores the importance of word and symbol in a decaying culture, as well as the marginalization and persecution of people based on heritage, gender, race or belief, and all that is lost in such persecution. Inspired by the Borges' story "The Aleph," Gideon started researching Kabbalah, which lead to researching Hermetic philosophy, alchemy, and occult societies. The Crumbling takes a modern and innovative form, while drawing from ancient texts and esoterica such as the Sepher Yetzriah, the Bahir, the Sepher Rezial Hemelach, the Hermetic Philosophy of ancient Egypt, and the mystical beliefs of Hildegard von Bingen.